We do some sort of art almost every day. Not only is it a great time-filling distraction but the kids are learning so much - colors, shapes, fine motor skills, focus, concentration, letters, numbers, etc. 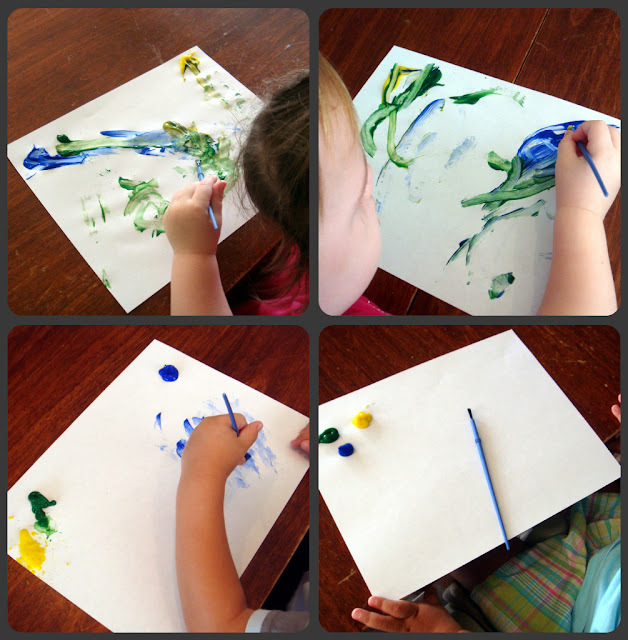 And art is one of many activities that allows each child to excel, because there is no right or wrong to it. I loved this project. It was great to see how each child handled the brush and painted, as each of them had a completely different attitude and approach. Some dove right in, mixing the colors and filling the page, while others stuck to one color before moving on to the next. I got the biggest joy from the child at the bottom right corner. She never complained and enjoyed watching the other children, but she had no intention of picking up that brush, at least not that day. Her page looked exactly the same when we were done as it did when we started. Such an independent spirit.